The new ATEM 1 M/E Advanced Panel is an elegantly designed professional hardware control panel for all ATEM switchers. 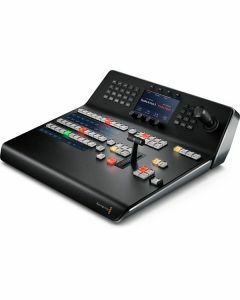 It combines modern design with the latest broadcast technology for faster workflows. The new design features a built in LCD and high quality curved buttons that help reduce incorrect key presses. The buttons also have colour backlighting to help you quickly recognize important keys. You also get a professional joystick for DVE and camera adjustments, smooth weighted t-bar fader and much more. The buttons feature dynamic displays that allow full customization of the labels as well as custom colours. The shift buttons allow you to double up the number of inputs by selecting a second set of shifted source buttons so you can control up to 20 inputs. The compact size and durable design of the ATEM 1 M/E Advanced Panel fits in a standard equipment rack, making it perfect for shelf mounting in broadcast trucks, mobile racks and fly away kits. Next Transition Selectors: BKG, Key 1 - Key 4. DSK Transition Selectors: Auto, Cut, Tie/Preview. Input Voltage: 1 x Internal 110 - 240V AC.